More and more people have taken a liking to flush mount ceiling fans. They are especially popular in households along tropical areas. Since the fans are designed to be closer to the ceiling, they are the ideal option for low ceilings and small areas. 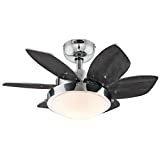 We are going to have a look at the top 10 best flash mount ceiling fans in 2019. This review is here to guide you in making the right choice. 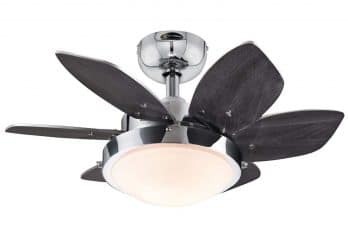 What to consider when buying the best flush mount ceiling fan? Why you need a flush mount ceiling fan? The first flush mount ceiling fan we are going to look at is from Emerson. 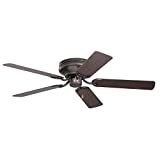 This fan is 52 inches in size and comes in an oil-rubbed bronze finish. It is one of the go-to fans if you plan to take on low ceiling applications. It comes with 5 reversible blades which are quite appealing. This has to do with the fact that the blades have a medium oak/ dark-cherry finish to them. The ceiling fan has an easy installation process and is considered to be a light fixture. You will definitely be impressed with the add-on accessories that it comes with. These include SW46 or SW90 which are part of its four-speed wall controls. I would recommend their purchase especially for people seeking additional controls for their light and speed needs. The fan is very adaptable, so adding a light kit will be easy to do. If you wish to do so, the company recommends that Emerson LK53 and LK65 light kits should be used. The ceiling fan has a long-lasting motor. The purchase is backed by a limited lifetime motor warranty and one-year warranty on parts and electronics. If you are after more air circulation, then this high airflow option is the way to go. 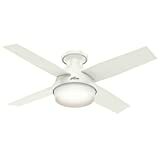 Hyperikon’s flush mount ceiling fan has an energy star rating and an amazing airflow efficiency of nearly 71 CFM/W. This is quite impressive but expected since it has a 4,400 CFM. You won’t have any regrets with this purchase since its 62W motor is up to the task. Combining such a motor with five 22″ wooden fan blades is one of the reasons for its impressive performance. One other reason why the fan is an excellent purchase is the numerous mounting options the user gets. All you will have to do is follow instructions and you will be good to go. If the room has an angled ceiling, the ceiling fan can be angle mounted. For normal or high ceilings, you may downrod mount it. Last but not least, low ceiling areas can have the fan flush mounted. The mount ceiling fan comes with a 5-year warranty. The fan has a two-way rotation feature. 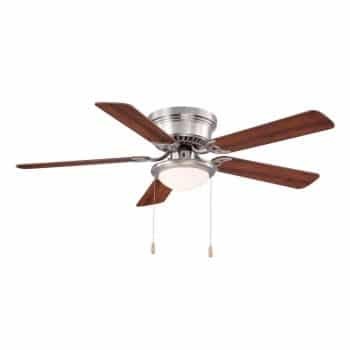 Hunter Fan Company offers a white ceiling fan option for people seeking a low profile direction. Some fans are quite noisy to a point where they can frustrate you. This makes it difficult to get some rest especially when you want to get some shut eye. With this fan, you will get whisper-quiet performance, thanks to its WhisperWind motor. However, you shouldn’t let its quiet nature fool you. The air movement it provides is ultra-powerful. What most people like about this fan is how it can be used during different seasons. During winter, the fan can be set to an updraft mode and a downdraft mode in summer. Having a reliable reversible motor is what makes this direction change possible. The flush mount ceiling fan comes with a light kit which is integrated with Cased White glass. You will also get two 9.8W LED bulbs. The fan is recommended for indoor usage. It comes with a Limited Lifetime Motor Warranty. Next, we have another quiet operation ceiling fan from Hampton Bay. It was built with a multi-capacitor which makes this possible. 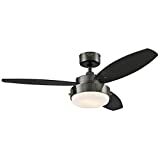 The fan offers excellent air movement and comes in a 52-inch size. One of the features which make it stand out is its capability to complement a wide range of interior accents. The fans reversible blades were designed in an interesting manner. One side of the blades has a walnut finish, while the other has a maple finish. 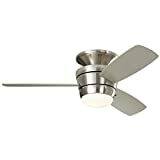 In addition to the fan’s nickel finish, it will make an excellent addition to your décor. The fan comes integrated with a frosted opal schoolhouse light fixture wall control. As far as flush mount ceiling fans go, this one works great for rooms measuring 20 ft. x 20 ft. The fan offers 3 speeds and has an airflow of about 4670 CFM. The fan uses a medium base bulb. If you have owned a Hunter fan before, then you certainly understand the value each purchase gets you. You can’t expect any less from a company that has over 126 years of experience. This should show you how seriously the company has invested in the fan business. Such level of expertise is not easy to find, especially in a market flooded with rip-offs. Each of their fans portrays the excellence they have committed to in the past century. 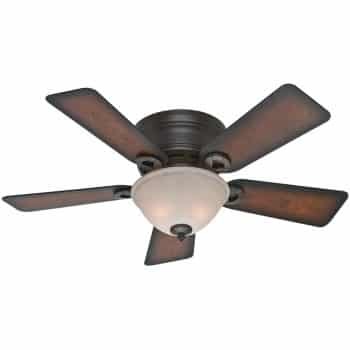 This Hunter 51061 Low Profile flush mount ceiling fan has outstanding craftsmanship. Not only does it look good on the outside, but it is equally tough on the inside. You can be sure that your household cooling costs will go down by 47%. In this day and age, it is important to save whatever penny we can. What’s even more impressive is in the summer, you will find yourself only raising your thermostat to 6 degrees. The fan offers whisper-quiet performance. It has 5 reversible blades. The Hunter Fan Company once again claims one of the top ranks in this review. Being a consumer favorite, this doesn’t come as much as a surprise. This option is, however; a little different from the first ones we came across. If dust was a constant nuisance to you, then owning this particular ceiling fan will make a lot of difference. It was made to repel up to 58% of dust build-up. This is possible because of Hunter’s patented Dust Armor nanotechnology. The company ensured that all the fan blades are coated with the technology during their manufacture. The fan uses two 60w candelabra bulbs which are included with its purchase. Its other benefit is that it can even be installed without a light kit. Whenever you want to make speed adjustments, all you will need to do is use the included pull chain. The ceiling fan comes with a bowl light kit with tea stain glass. It uses a WhisperWind motor. Some fans bring out a sleek contemporary look better than others. If you are looking for such a fan, the Minka-Aire F518L-WH is a good fit for you. The company boasts of the quality and dependability in which the fan offers. Not only will it provide you with the much-needed comfort, but the visual aesthetics the fan offers will excite you as well. With this purchase, you will be saying goodbye to the bulb replacement nuisance. The reason behind that statement is because the fan has an efficient integrated dimmable LED light. You will be getting two benefits when you buy it. 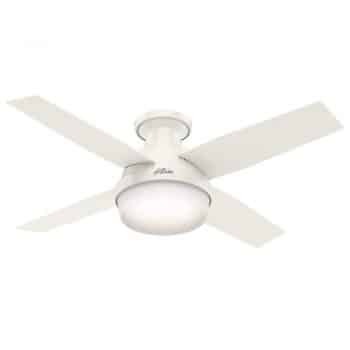 The flush mount ceiling fan has a 4-speed remote control. Its wingspan is 44inches in size. Westinghouse Lighting has one of the most stunning fan designs in this review. This is a must-have for anyone who plans to enhance a variety of rooms, including small kitchens and walk-in closets. The fan blades are asymmetric and it comes in a very modern style. Aside from its appeal, the fan has so much more to offer. It was designed to be an energy efficient option and can be used all year round. Its airflow is approximately 2039 Cubic Feet Per Minute and it works wonders for areas up to 100 square feet. The motor has a lifetime warranty but all the other parts have a two-year warranty. The purchase includes mounting hardware. It uses 31watts of electricity. Westinghouse Lighting snatches another position in the top 3 section of the list. This fan has a luminous gunmetal finish which makes it really stand out. The fan blades’ black and graphite finishes can be customized to match your home. Aside from that, the opal frosted glass fixture will do wonders for your décor as well. You will find yourself completely in love with the illumination. The fan can be operated in modes. It should be run counterclockwise in summer mode, to provide you with a wind chill effect. When in the clockwise direction, the fan is in winter mode. This enables it to evenly distribute the warm air that collects near the ceiling. Thanks to this, there won’t be any cold spots or drafts in the room. The ceiling fan has three fan speeds. You will get a lifetime motor warranty. At the top of our list, we have the Harbor Breeze Mazon flush mount ceiling fan. Its design can be described as a contemporary take on the traditional ceiling fan. The fan has a mid-body layout and was built using industry leading materials. It looks compact but works just as well with medium sized rooms. The fan comes with an integrated 18-watt LED module which can even be dimmed if need be. It comes with a handheld remote and a wall cradle as well. This is highly convenient since the fan can be operated from any position in the room. The ceiling fan has a reverse airflow feature. It has a 3-speed reversible motor. 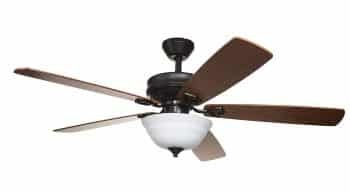 The décor: You need a ceiling fan which will be in line with the décor of your home and office. Choose one which will bring out the needed look and complement the area. Settings: Fans with several settings make it easier to customize the kind of atmosphere you need for the room. Functionality: Nowadays fans can even be used in winter. You need to be keen on the features of the ceiling fan you are buying. If you choose well, you can get one to use all year round and not just in summer. For cooling: They come in handy especially during hot days, where they help bring the room temperature down. For air circulation: Ceiling fans are great for ensuring that rooms are well aerated. 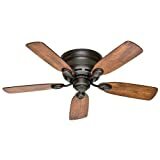 This wraps up the top 10 flush mount ceiling fans review. You are now equipped with more knowledge since you started reading this review. People are drawn to different things when buying ceiling fans, but it is important that you always take the factors listed above into consideration. This way, you won’t end up buying a fan which will not meet your needs.